This Fellowes Powershred 79Ci Cross Cut Paper Shredder features a 100% Jam Proof System that eliminates paper jams and powers through tough jobs. 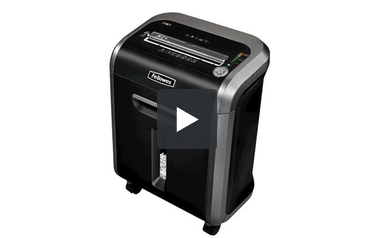 Its SilentShred feature offers an ultra-quiet shredder performance for shared workspaces. Plus, it has SafeSense Technology that stops shredder when hands touch the paper opening. This shredder can shreds 16 sheets per pass into 5/32" x 1-1/2" cross-cut particles with security level P-4, and has a 6-gallon capacity pull-out waste bin. This Fellowes Powershred 79Ci Cross Cut Paper Shredder is backed by a 2-year warranty on machine and lifetime warranty on cutters. Maximum run time: 20 on / 30 off. On time, better than what we expected. I’m a collector, an octogenarian, so have for many years saved cards, letters and poetry from my husband, mother, children and friends; love letters from old boyfriends; receipts, and records of work and business, all too personal to throw in the curbside trash. Did I want my children to encounter this mountain of paper clutter? NO! So I bought three shredders one-by-one. By file fifteen, or less in one case, they clattered, stopped, had to be begged to take one sheet at a time. Finally growing discouraged I started looking at other people’s opinions of better shredders; perusing reviews by those who’d tested several shredders and discovered the Fellowes PS-79Ci had a good reputation. I bought one, however I was dubious of its staying power. I am having a grand surprise. To empty the previous shredders I had to lift off the tops which were awkward and heavy. And they all filled much too quickly. My Fellowes container is large enough to hold one stuffed file which works for me, the weight being just right to manage as I slide out the basket and dump the pieces into a garbage bag. Too often the other shredders were hot, quit working, always before I could get the contents of one file folder through them. This shredder gets hot after about three stuffed files. That’s just right, too, for I’m tired of sitting by then, ready to walk around for awhile, smell my roses and admire the moss rose … or start lunch, drink a cup of coffee, relax. Forty-six large black garbage bags of shredded paper later, I am thankful to all of the people who suggested I buy one. I estimate I have forty-six more bags at least to go, but now have the faith … my Fellowes is up to the job. And happily, in a final win-win, a nephew is plowing under the shredded material as mulch for his next year’s garden so my lifelong collection of memories will live on. I visualize them now … as tomatoes, peppers, cucumbers. I purchased 2 of these; one for our library branch and one for another of our branches. The main reason for purchasing this particular model was the decibel level. Being that we are public libraries we need them to be as quiet as possible. My expectations were exceeded. The noise level is very minimal and hasn't jammed. Great machine for the price. I shred lots of DVD's and junk mail raw. So far this does very well. It jammed once, pushed it back up automatically and then re processed by itself. It's quiet. I like that! Welcome to MyBinding video. 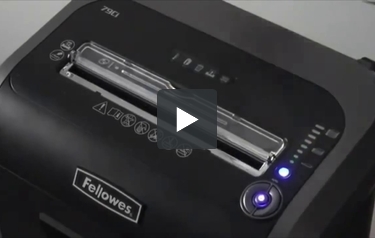 This is the PowerShred 79ci, a cross cut paper shredder by Fellowes. The 79ci is the ultimate deskside shredder for small offices or shared work spaces. With silent shred technology and 100% jam-proof system, this is a pleasure for all to use. It can shred up to 16 sheets of 20lb paper at a time and shreds at a speed of 11 feet per minute. This machine is capable of shredding paper, cards, credit cards, CDs, DVDs, staples, and paperclips. Plastic guide and guard flips down on the front for easy credit card and CD shredding. The 79ci is safe and quiet. SafeSense technology allows for the machine to stop the moment a hand is near the opening and restart when the hand is away. A light gauge on the right-hand side will let you know if your paper stack is too thick. If it is, you can simply hit the reverse button to back it back out and place it back in in smaller batches. The waste basket is accessed from the front and has a six-gallon capacity. The cross cut shred is great for sensitive documents and has a level three security. It's great stationary and comes with four casters if you want to roll it around. That is the Fellowes PowerShred 79ci. For more demos, reviews, and how-tos, check out MyBinding.com. Hi, I'm Mitch, and this is the 79Ci from Fellowes. This 16-sheet cross cut shredder can shred staples, credit cards, paper clips, CDs, and DVDs. It includes a six-gallon pull out bin and can shred continuously for 12 minutes before it's cooling down period. The 79Ci has several unique features. The patented 100 percent jam-proof system eliminates jams by preventing the shredder from taking in more paper than it can handle. Simply remove excess paper and resume shredding. The jam-proof system also powers through mis-fed paper. The light bar will give you visual feedback while you shred. Green to yellow means you are within the recommended paper capacity, thus maximizing productivity. The 79Ci also features patented SafeSense technology, which stops shredding when hands get too close. The shredder also includes silent shred performance, making it ideal for deskside use. Again, this is the 79Ci from Fellowes, manufacturers of the world's toughest shredders. Fellowes is one of the go-to names when it comes to paper shredders, including ones designed for personal use. Their new IntelliShred PS-79Ci is a very advanced shredder and one you should definitely consider if you’re in need of a way to destroy your documents. Here are the pros and cons of this product. The PS-79Ci can handle up to 12 sheets of paper per pass. There’s a 9-inch feed opening for both letter- and legal-sized documents. This product can also be used to shred credit cards and CD’s, as well as paper clips and staples that have been left in your documents. Although this is a personal-sized shredder, it offers good security because it’s a cross-cut device. It will turn a sheet of paper into many, many pieces that measure 5/32″ x 1-1/2″. This machine has a waste bin capacity of 6 gallons. The bin can be pulled out and emptied with no problem. A window on the front of the bin allows you to see how many shreds there are in it. One of the best features of this machine is its ability to prevent paper jams. It has a sheet capacity indicator that will alert you if you’re trying to shred too much at once. (If the indicator is inching up towards red, be sure to remove some sheets.) Also, if you do end up with a misfeed, the PS-79Ci is powerful enough to claw its way through the paper so you don’t have to solve the problem yourself. There is also a reverse function you can use. This device also has two of Fellowes’ most popular features: SafeSense and SilentShred. The latter is the machine’s ability to detect body parts near the feed opening. When that happens, the machine will shut off so an injury can be avoided. As for SilentShred, this feature ensures that the device will operate quietly. This is a good feature to have in a shredder, especially if you work closely with other people. For added convenience, this product has casters to make transport easier. There are also hooks on the back of the device to wrap the power cord around when the shredder isn’t being used. As is typical with Fellowes products, the PS-79Ci is covered by two great warranties. The first is a 2-year warranty on products and services. Plus there’s lifetime protection for the machine’s cutting head. The PS-79Ci lacks a continuous-duty motor. It can shred for up to 12 minutes before needing a rather lengthy cooling off time of 20 minutes. Therefore, this device is good for personal use, but it wouldn’t be too useful if it was used by multiple people. All of the waste is mixed. There isn’t a separate bin for credit card or CD scraps. This is a very advanced personal-sized shredder and all that technology comes at a price. This is one of more expensive shredders on the market, so it might not be a good choice for individuals on a budget. The Fellowes IntelliShred PS-79Ci is one of the best personal shredders you can buy. Although it has a long cooling off time and it lacks a bin for plastic waste, this is definitely the machine to get if you’re an individual looking to protect yourself from fraud and identity theft, and you can afford such a device. Throat Width 9" 9" 9" 9" 8.8"
Unit Dimensions (H x W x D) 21.4" x 15.4" x 10.4" 25.2" x 11.14" x 17.3" 25.2" x 11.14" x 17.3" 25.2" x 11.14" x 17.3" 25.63" x 14.5" x 10.5"